Fresh from the opening of As the Cosmos Unfolds (Formationism.1), Cob Gallery curator Alexander Glover talks to the founders of Formationism about finding the balance between the physical and the conceptual, meaning and artistic process. 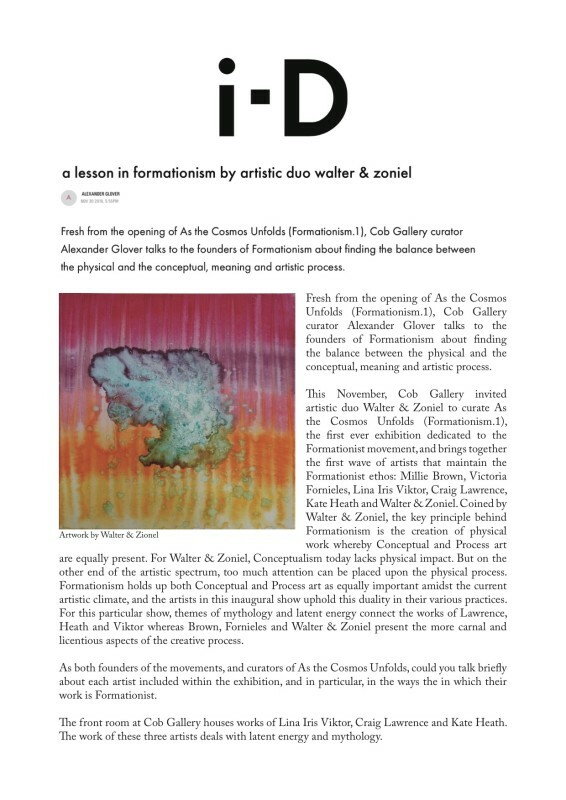 This November, Cob Gallery invited artistic duo Walter & Zoniel to curate As the Cosmos Unfolds (Formationism.1), the first ever exhibition dedicated to the Formationist movement, and brings together the first wave of artists that maintain the Formationist ethos: Millie Brown, Victoria Fornieles, Lina Iris Viktor, Craig Lawrence, Kate Heath and Walter & Zoniel. Coined by Walter & Zoniel, the key principle behind Formationism is the creation of physical work whereby Conceptual and Process art are equally present. For Walter & Zoniel, Conceptualism today lacks physical impact. But on the other end of the artistic spectrum, too much attention can be placed upon the physical process. Formationism holds up both Conceptual and Process art as equally important amidst the current artistic climate, and the artists in this inaugural show uphold this duality in their various practices. For this particular show, themes of mythology and latent energy connect the works of Lawrence, Heath and Viktor whereas Brown, Fornieles and Walter & Zoniel present the more carnal and licentious aspects of the creative process.